This place was amazing! We had a big group, 8 people and 2 dogs, stay here for 3 nights and it was a great little mountain getaway. There were great hikes within an hours drive and the town was lots of fun to just hang around in. Time spent lounging in the house was also great, lots of seating space for movie nights and big family dinners! Highly recommend this property! Highly recommend Mountain Escapes rental for great place for the weekend in the north Georgia mountains! Thanks Bryan McMillian and Erica Stewart McMillian for a great experience.....we will be back! Gorgeous cabin with incredible views close to everything that downtown Blue Ridge has to offer. 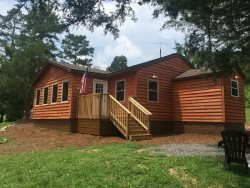 We had the best time with our family, and would definitely recommend this cabin to anyone looking for a North Georgia getaway! The cabin is very spacious and clean! The back deck offers great views! There is a grill and smoker and plenty of deck space for cooking outside! Overall great place and easy to get to. Its just a short 10 min drive to downtown blue ridge. Beautiful cabin and a great location!! Bryan responds quickly to any questions.